Visit Our Store in Second Life! Version 1.1 has been released! Please read the Release Notes. If you missed the update, you can use the 'Recovery' sign left of the billboard in Aggro: SLurl. To make a request, please add it to Feature Requests. Gesture commands be found on the Gestures page. Each dragon uses tamed deformations to enable their long stance and large size with full BVH animation articulation. That means that the underlying avatar's skeleton is stretched to fit snugly inside the dragon's anatomy and the resulting animation is as clean as if the dragon were the size of a human avatar. All scripts as of v1.1 are compiled in Mono. Every available coloration comes with the dragons in the form of a HUD from which you can select pre-configured liveries. This includes the standard dragon colors such as red, blue, green, black, as well as unusual looks and realistic reptilian camouflage. Potential custom combinations: Quite a lot. The dragons come in three sizes, each with three different head variations. Each size also comes with a bipedal dragon which is human-sized, that has the same customization, expressions, jaw operation, and head selection. Note: Bipeds and Juveniles don't come with saddles. Another unique aspect of these dragons are the facial expressions. The bulk of the head is made up of a single sculpty, which allows us to switch that sculpty with another to change the shape, and offer moods. To offer more control to expressions, the mouth can be closed, partially open, or all the way open, and the eyelids can be open, halfway open, and closed. Dragons blink (it should be noted that eyelid movement has realistic speed here). The eyes also move around slightly, since idle beings tend to focus on different details in the distance. The effect makes the dragon feel a bit more alive. 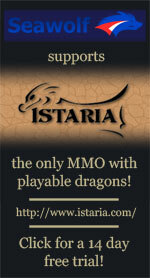 If we come out with updates to the dragon, users will receive them automatically. Updates may take the form of bug fixes and new features. Drag the dragon folder onto your avatar. When switching to another avatar, be sure to click on the undeformer object which spawns. To use breath weapons: Enter mouselook. Left click for a fireball. Hold left click for fire breath. While there is quite a bit more to the dragon than this as an avatar, that's all which is required to start using the dragon. The AO will take care of the rest of the animations. Why do I need to use the undeformer after taking the dragon off, if my character looks fine? SL may render your character as deformed on other people's clients, while rendering your character normally on your own client. You will only need to tap the undeformer and the process will complete with an audo-deletion of itself. This is currently our easiest solution, with the alternatives being teleporting some sims away and back, or relogging. The undeformer object will automatically delete itself after 30 seconds if it's unused. The dragon clips through objects and people, is it possible to have proper collision detection? How come fireballs, iceballs, splashes and dust poofs don't show up? These features require object creation to be enabled on the parcel where they occur. The flapping noise is starting to get annoying, can I shut it off? Yes, on Page 1 of the HUD the button labeled Flapping Toggle will shut off the flapping noise. Customization performance is INSANELY SLOW, what's going on? Chances are you're in an openspace sim, which simply cannot handle complex scripted objects. This is an issue for any complex item in SL on any openspace sim, I'd recommend doing customization in a regular sim. The HUD will inform you that you're in an openspace sim and that performance may be poor when you use any customization button on page 1. You will only get this message once, until you cross a sim border. Alternatively, you can look up the type of sim by finding the total prim count by going to the objects tab in the land window. If the total sim prim count is 3750, it's an openspace sim. Regular sims have 15k prims or more. Slowness may also be induced by the overpopulation of avatars or excessive/inefficient scripted items in the current sim. Alternatively, there may just be something in the sim that's causing lag. Try moving to a different sim and see if the problem persists. When I select a colorful skin from the texture selection, it doesn't draw with it's proper colors. Non-monotone textures should be applied to white parts, tap the white selection under �Default Colors� and the texture should draw correctly. As a rule of thumb for dragon customization (and anything else in SL for that matter) is that monotone textures are usually the best type to tint with colors, and colorful textures are best left �white� so the original colors remain pure. This doesn't mean that colored textures can't look interesting with some tint, but they'll lose their multi-toned effect. When changing the decals (stripes, spots, etc) nothing happens and they don't show up. If you clicked on a livery that has the decals turned off, and used that as a base for your custom livery, you will need to make the decals opaque (visible) because they're currently set to full alpha (transparent). This is done by clicking the red partially transparent sphere icon with the up arrow. There are ten levels of transparency, so to make it fully opaque you would click it 10 times. 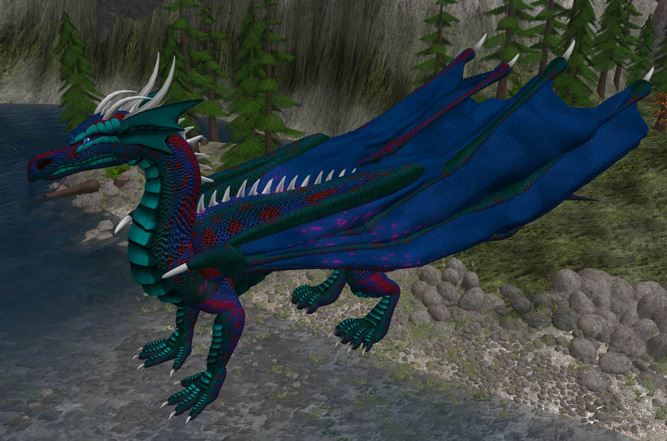 You will not need to use chat commands or dialogue menus to operate any aspect of this dragon, with just two exceptions: custom liveries and the wiki shortcut. When you save a custom alpha into one of the HUD's slots, you will need to type the name into chat. This will be explained further down this guide. As for the wiki link, SL's security requires you to confirm a page link before the page displays. The hud's primary functionality is to allow the user to apply colors, textures and visual effects to groups of parts and then save their own completed looks into loadable slots. Relevant textures appear on a scrolling bar for each part. In addition to an RGB controller there are a series of selectable colors, as well as several color save slots. One of the big aspects of customization are the decals, which overlay the main pieces of the dragon's anatomy. Decals offer an extra customizable tone to the body parts and are capable of some unique effects, including the Star Dragon's glowing starfield which stands out from the rest of the otherwise dark body at night. Every toggleable and selectable action is operated by the hud. There aren't any dialog menus, and the only time a text command is used is to handle custom liveries, which require you to name them. The hud has a bar mode with a few of the common features, as well as a minimized mode where you only see the bar and page buttons in the corner. Toggling flight and swimming will reset the neck position. The neck will automatically toggle upwards near the surface of the water. Pretty self-explanatory. The style of sitting for these creatures is full on the stomach. You will resit after walking if you do not untoggle sit. Flight will reset the sit status. This is simply automation of flying forward, which is good for long-distance flights. You must be flying, and after toggling autofly, press the forward key to initiate it. To stop autoflight, click the HUD button again. Autoflight will also be toggled off if you stop flying. Pressing this will rez a saddle, provided the current parcel has build enabled. Saddles enable two passengers to ride along on the dragon. The dragon must sit on the red prim inside the loop. The passengers must sit on the green prims just over each saddle. 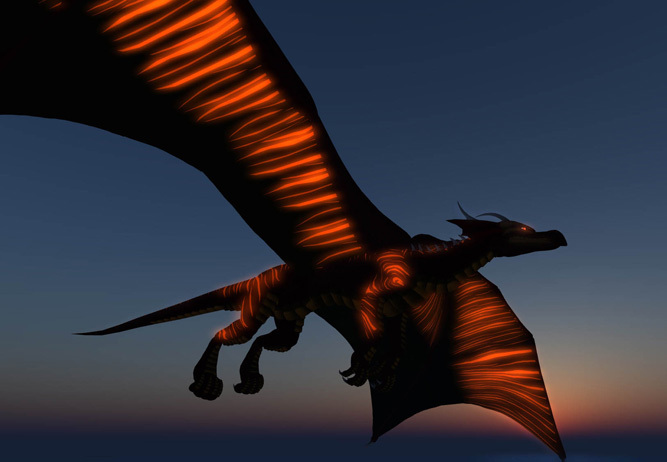 The saddle uses the same controls as avatar flight, and operates at approximately the same speeds. The saddle currently only operates in flight. To reduce litter, the saddle will delete itself 30 seconds after it's unsat by the dragon. It will not delete itself otherwise, since it's moddable. To make a modded saddle rezzable via the hud, you must replace the hud located in the dragon's hip contents with the new copy, and make sure it's named the same. Please note we don't offer tutoring on the modding of the saddle, this requires basic knowledge of SL's own editing tools. A minor feature. While the state of the dragon (flying, swimming, sitting) dictates when the fingers and toes will curl, they can be temporarily overridden by toggling these buttons. Switching states will reset the fingers and toes. This will toggle the special camera used to provide some distance between the dragon and your viewpoint. This is default on and except in some odd cases doesn't really need to be shut off. The two growls play once per press, while the audio button labeled Flap: Toggle will toggle the audio of the wings flapping during flight. You can toggle whether the dragon breathes fire or ice. While in first person view, tap the left mouse button to shoot a fire or ice ball. While in first person view, hold down the left mouse button to shoot a continuous stream of fire or ice. Fireballs and fire breath is able to set some of the trees in Aggro on fire. Currently we're working on a tree pack to distribute which will be interactive with dragons in ways such as this. 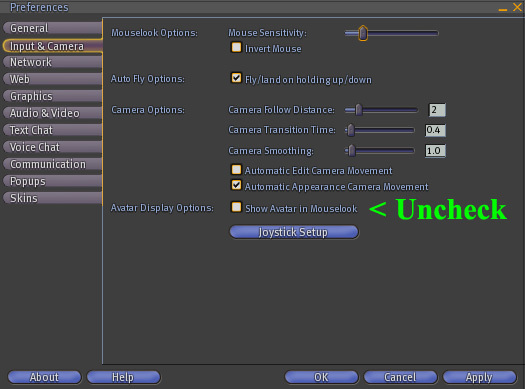 Uncheck "show avatar in mouselook" in SL's preferences. The dragon's geometry will block your view otherwise. These three buttons directly control the position of the mouth. Talking resets the state of the mouth. Opening the mouth is also useful for coloring the inner mouth, teeth and tounge. These directly control the position of the eyelids. Going into away mode will reset the position of the eyelids. Takes you here. Click the "go to page" button on the dialogue menu when it pops up. This lets you change the dragon into any of 21 pre-configured liveries. These include standards like red, green, black, realistic variations of iguana, snake, fish, and some unique themes like shiny, starfield, and solid black. Page 2 of the HUD is where the extensive customization occurs. For simple pre-configured theme selections, see Stock Color Presets section on Page 1. The basic operation of this HUD consists of selecting a body part at the top, choosing the visual effects and colors you want for it, and repeating for other body parts until you get a look you like. At that point, you can save the look in a slot at the bottom. Each body part selection allows you to apply colors, textures and visual effects to a series of dragon parts which make up a section. This is substantially easier than using SL's own editor, which would require hand-selecting each individual prim. This is especially useful for changing the scales and body decals, considering the difficulty in selecting the scale prim beneath the decal prim. The currently selected body part is highlighted in green. Visual effects consist of glow, fullbright, shiny, transparency, and bump. The top row deals entirely with direct glow selection. On the second row, from left to right, is fullbright off, fullbright on, shiny down, shiny up, transparency down, transparency up, no bump, darker bump and brighter bump. Shiny and Transparency cannot be activated at the same time, and depending on the part one selection or the other will be blacked out. Example: SL prohibits applying shiny to decals, so the shiny option is disabled on decal body parts. From left to right, you have the RGBL color selector, color presets, and color saver. Generally, it's best to ballpark the dragon's look using the presets, and then tweak the colors using the RGBL mixer. 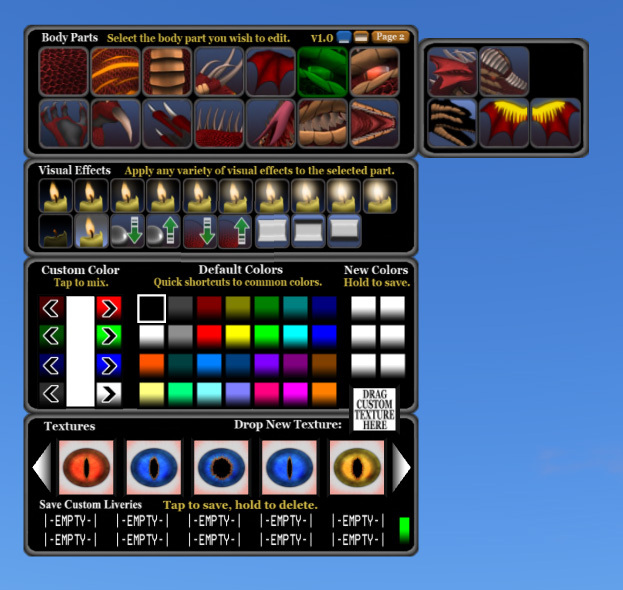 If you need to apply a specific custom color to various body parts, you can set that color aside by holding down the left mouse button on one of the custom color slots until it's saved. On saving colors: Holding down the left mouse button on a slot will save the color, while tapping the button will use that color. The luminosity arrows at the bottom change how dark and light a color is. 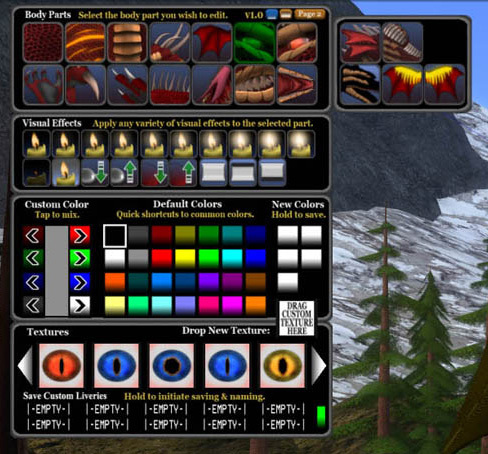 When a body part is capable of texture selection, the various textures are displayed as buttons in this section. The left and right arrow icons will scroll to the next or previous five textures. Clicking the left arrow to go beyond the end of the list (for example, the left arrow on the first page) will take you to the opposite end of the list. If a multi-colored texture doesn't look right on selection, make sure the relevant body part is colored white. Any color besides white applied to a prim with a colorful texture will tint that color off, due to the way SL handles primitive tinting. To use a custom texture, right click -> edit the HUD, and select the Content tab in the edit window. Drag the fullperm textures into the Content tab in the edit window. You may then exit the edit window. In order to select the textures, click on the bodypart you want to apply the texture to, then click on the white "Activate Custom Inventory Textures" button that is up and right of the texture selection boxes. This will cause the visual list of textures to display the textures currently in the HUD's inventory. Clicking on any of them will apply it to the current bodypart selection. Please note that some bodyparts, like the teeth and mouth, don't accept texture changes at this time. You can tell which ones don't because when you click on the bodypart, it will say "No Support" in the If you want to apply a custom texture to these, you'll have to do it manually by editing the prims. Finally, at the bottom are ten save slots for your own custom liveries. To save your dragon's current look, tap any of the slots and type a name into local chat when prompted. To delete a livery, hold the left mouse button down on it. To complete the deletion you need to type "YES" in all caps without the quotes. Note: When changing a livery, or especially the decals or glow on the arms or wings, do not fly or land while doing so, or the livery will apply to the wrong set of wings or arms. To fix, simply fly and unfly again. Are you friendly to critique and feedback? Definitely! You can send feedback to either Stickman Ingmann or Verkin Raven, although Stick generally handles scripted features/animation and Verkin the art and effects. Can I affiliate vend your stuff? ''Why don't you sell product colors individually? Shouldn't you sell the biped dragons separately from the quads? Anybody who wants just a biped dragon would buy the juvenile dragon anyway, since that package costs about what the price of a biped dragon would be anyway. Has Seawolf switched to avatars now? What about the boats? Art and documentation are Verkin Raven's fault. Animation and scripting are Stickman Ingmann's fault.